Get it on Amazon for only .99 cents!!! 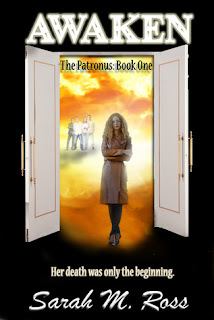 Blurb: Lucy Donovan was supposed to have a weekend of fun in the sun, celebrating her upcoming graduation from college. In a split second, everything changed. A drunk driver ended Lucy’s mortal life. The writing was great, I knew and felt the otherworldly-ness of the realm. She managed to let us into Lucy’s mind and see the story through the characters eyes and still drop some hints without giving everything away. Am I making sense? Just know it’s a fresh perspective and she has a great voice in her writing. Doubtful. Editing wise it was clean with very few typos. The story itself was right in the PNR/YA genre and it tried to stay there but there were enough quirks, and interesting new ideas thrown that it became this cool new thing unlike other )non) angel stories. We all know that I would have loved to see more with Max and Lucy but it is only the first book. I love me a steamy YA romance! Love it! And I think these two characters were given just the right chemistry for me to LOVE their story. However, it’s a series they have plenty of time to discover their relationship. It’s a slow burn not an instant we are making out all over the place love. I love Lucy’s sarcastic side and would love to see it flushed out more. Is she a doormat…uh far from but she holds her tongue too much. I want to see her in her full glory of sarcasm. She had some great LOL moments and I think she is a riot when she’s not holding back. What was holding it back from 5 stars. It was way too short. We were just getting to the juicy parts and boom…THE END. Sigh. Why? 🙁 I wanted to keep reading. Overall a great read. It’s got vampires in it too, although they aren’t dreamboats (AWESOME, RIGHT?). Did I cover everything? I think so. I want to talk about this book soo bad but I don’t want to start getting all fangirly and start spouting spoilers. Just go read it. Please! Oh and Patronus makes me think of HP. So I kept being like what the heck…a Patronus is something you conjure to protect yourself from Dementors not these dudes. Haha. Just kidding. I’m not that big of a nerd.